For me, it's grief counselors. How did we ever grieve before they arrived on the scene? "Every profession is a conspiracy against the laity," said GB Shaw. We seem to constantly create professioanl cadres who want to be paid to do what friends and relatives used to do. This, in my opinion, is counterproductive. It encourages people and their communities to further abandon normal modes of human behaviour in favour of pseudo-professional help. The life coach is already a dying breed but I am sure its predecessor is just around the corner. Western world affluenza (yes I do buy into it) is the chief culprit. I wonder what the job market for life coaches are in say.. Darfur? Quote "Life coaches as like low life astrologers. Is there anything more nauseating or narcissistic than the very idea, never mind *the type of person*, who sets themselves up in such a role?" What an ignorant, unpleasant and thoroughly unlikeable individual you must be. More 'anonymous' life coaches! Isn't it rather ironic that YOU seem to care enough about what I think to read and then you COMMENT! Life coaching, like NLP seems to be beyond criticism. No it's not beyond criticism Donald - grow up, just like elearning is not beyond criticism - an industry you made your money out of when many people were highly cynical of its benefits and saw it as hyped-up rubbish - but life coaching is certainly beyond the nasty, offensive trash you've dished out that targets the 'type of people' in the industry as well as the industry itself as if you have some God given insight into the personalities and motives of hundreds of thousands of coaches world-wide. life coaches make a very modest living trying to help other people faciltate change in their lives. If you have no emotional intelligence at all Donald, at least show a bit of respect for an evolving industry (just like elearning was a few years ago while you were making your millions) and for those many many people that have benefited from life coaching. Alaways gets me that one - 'lack of emotional intelligence'! And the so-called 'Life Coaches' who posted the anonymous bile above no doubt have oodles of the stuff. I am looking to get in touch with folks who like yourself share a negative outlook on NLP. I have had some less than great experiences with NLP practitioners, and would appreciate being connected with resources about countering the manipulation. Please contact me at my email address when you can, I appreciate it. my life was saved by a life coach. she was an angel that swept me up and has brought me to an amazing place. if it weren't for the concept i'd probably still be where i was two years ago. now, i am able to pass this on to others. and, if you researched anything about life coaching, you'd know they dont take any credit for the recovery that comes from it, so there isn't arrogance. I am not a life coach, but interested in pursuing a career as one. I think the comments posted in this blog are over-critical and ill-placed. Of course it is very important that we have friends and family that we can lean on for support. And coaching doesn't threaten the fabric of community. But coaching goes beyond a friendship. Your friends cannot dedicate their time and focus their energy into supporting you when you feel at an utter lost of direction and accomplishment. And "I'm sorry you're going through this," doesn't cut it. This usually didn't happen overnight and is going to take time to be undone. Your friends are not always going to have the integrity and optimism to listen openly, non-judgmentally and provide critical and objective feedback. Why? Because just as you expect people to get friends to help them through tough times. Friends expect friends to figure it out themselves when it comes to life and many of them are so involved in their own lives that they don't have the time nor energy. I'm ranting now, but I think this profession isn't about narcissism nor arrogance. Some people, like myself, feel a sense of fulfillment and warmth in demonstrating compassion toward others. It takes time, patience, an openmind and strong character - particularly one of high integrity and leadership abilities. Life coaching is a great way to share those talents with others, and as with any other profession be paid for your time. By the way, grow up! It's absolutely pathetic to see adults use sarcasm and name-calling to be critical of something. It only illustrates your lack of maturity and knowledge on the subject at hand when you throw around superficial and surface insults. This blog would be much more effective if it cited research and used intelligent analysis in its attacks at the profession. I don't hide behind anonymity - and read my blog with a little more care - it's full of academic references - unlike your post. As I said in my title - I ahve a life and certaily don't need aonymous, arrogant coaches like yourself to guide me on my way. Each has an opinion; a life coach is a beautiful thing to the person who requires or desires one. A blogger can be horrible; but people's lives are changed by blogs and by life coaches. Sometimes people take serious what they pay for; rather than what a friend tells them. I think all should get a life; but they may need a coach to do it. In my experience, the NLP / 'life coaches' that I've met have been just plain smug. As if they just invented the wheel and they need to bang on about it, all the time. "Hey look at me, I've invented the ... wheel!" "Yeah, thanks, got one of those already." A search for criticism on the "Life Coaching industry" brought me here, and I certainly found it. Every industry has its pioneers and profiteers and this is certainly one of them. While searching for constructive criticism I appreciate diplomatic, holistic perspectives like yours Leo Stone, thank you. I’m not sure who you are Donald Clark, and frankly I don't care. Your one sided, narrow minded perspective reminds me that there are still many people who would benefit from some good counselling to find compassion for themselves and others. To somehow assume that everyone in this world has a sincere friend to turn to in times of need does show some ignorance on your behalf Donald. Counselling is all about accepting criticism on your past words and actions, taking it on, and adjusting accordingly. If you would take on some of the points of views voiced above, you might just open your mind to the possibility of stepping beyond your ego and trying some Life coaching for yourself... I would love to hear your first hand account of a session with a reputable life coach... I dare you!..? Well Marrs Marrone - if you are typical of the breed, rude, abusive and devoid of argument, I'll give the dare a miss. "I’m not sure who you are Donald Clark, and frankly I don't care." -is this attitude typical of the fraudsters in your field? As it happens I know a number of Life Coaches and have been brave enough to voice my sincerely held opinions at 'Coaching' conferences (by invitation). I stick to my view that it is a chrlatan profession, trying to cash in on what used to be normal, caring support from family and friends. I was looking for jokes about life and business coaching - could not find any - and landed here. Well done and said Donald, another example of post industrial society creating a "need" out of very little. It has been described as cheap therapy offered by poorly trained hobbyists (who have undergone similar therapy) "devolving" out of the Californian psychobabble of the 1960s? I don't know but the coaches show great commitment and belief, and non acceptence of alternative views. Thank you! My ego-driven and self-centered sister in-law will be certified soon as a life coach, and I shudder to contemplate her effect on clients. She thrives on knowing what is best for everybody all the time. With luck, she will be sued before she can do any real damage. I permanently declined her unsolicted advice years ago. The idea of a life coach is creepy... I have a mother, a shrink, and a husband who know me best. Maybe I'm just lucky. Why do we need life coaches? We already have psychologists, psychiatrists, and counsellors who have extensive training and have established ethics and governing bodies. Life coaches are not trained sufficiently to recognize when an individual is suffering from a serious problem. However well intentioned, they can and often do more damage than good. I would recommend anyone who is in need of a life coach to seek the advice of a true professional with the requisite training. Leave psychological issues to professionals. A PhD in psychology takes 6-8 years, defending at least 1 thesis and extensive study. Psychiatry takes a medical degree and then further specialization. Professional standards and ethics are maintained by industry and semi-governmental bodies. There may well be ethical and professional life coaches, but how would you know? In my experience life coaches are attempting to perform the specialities of trained professionals without doing the homework. You seem to have a significant hostility towards Coaching. Have you had a negative experience with one personally? tcrane: No, but I do object to people like you who assume that everyone who disagrees with their worldview, is psychologically 'damaged ' or has had a 'bad' experience. Play Freud if you will, but not on me! I am noticing a significant amount of hostility from you for such a simple inquiry. I have not attempted a "Freud" on you, nor do I take exception to people holding individual views. In fact - that is what makes this world such an amazing place - all the ways we can see the same thing so differently. I am simply curious about your personal experience with this field. I understand this is a blog and so there is no requirement to actually investigate a subject - I was just wondering - why there is so much anger directed towards this particular field. I understand if you do not feel comfortable discussing this. Have an amazing week! "You seem to have a significant hostility towards Coaching. Have you had a negative experience with one personally?" The premise behind this question is clear, and common among those that practise coaching,mentoring, NLP etc. ; that a critique of such techniques betrays psychological damage within the critic. It's patronising. By all means discuss and debate the issues, but I won't put up with little digs and psychological accusations. I've had considerable contact with coaching, mentoring, counselling, NLP etc. over nearly 30 years in training and education. I've spoken at 'Coaching' conferences and have expressed my 'hostility' towards these techniques in many blog posts. I think the whole enterprise is based on false pseudo-Freudian, then Rogers type, theories and does more damage than good. I'm in two minds about this one. Some good arguments have been put forward both for and against life coaching. Perhaps that's because there are indeed good arguments for and against. I do admire the passion in some of the previous posts, but then again, sometimes it's good to be a bit dispassionate. In much the same way, my comment is saying something and nothing at the same time. Any thoughts on why sitting on the fence is either the way to go, or completely wrong, or even a bit of both? 'Sitting on the fence' is only a virtue if you draw an agnostic conclusion due to the lack of evidence. On that front I'm a massive agnostic on all sorts of issues. On 'Life Coaching' which has its origins in Freud then Carl Rogers, I'm clear. The theory is false and the practice bogus. see my other posts on Freud and Credit Crunch. Where would a football team be without a sports coach? A Life coach is not a friend, but someone who nudge you to tap into your hidden desires. All people have dreams and hope and certain goals they want to fulfill. Some of these are too stressed to even begin thinking about it while others already know what their life purpose is but has no idea where to start, where to go, what to do. Other people simply are not organised and need someone who makes them buckle up and find that focus they need to become who they want to be. People who are clear on what to do and are already living the dream would not seek a Life coach. But isn't it good for the other people in the world to have an option. A coach does not hurt anyone, so what's it to you? "What's it to you?" You need some coaching on coaching! I suppose a pink website with high heels may pass for 'life coaching' in some places but, for me, as you asked so politely (! ), it's typically lightweight. What gives you the right to proclaim yourself as someone who knows about 'life'? Sports coaches have accredited skills in their sport - what do you have other than a pink logo with six inch heels? And don't say 'glamour'! Thanks for the psychological and educational profile Mia. There's certainly nothing you can help me with. Buying pink high heels doesn't mean you can look down on people. Why make rude personal comments on a blog then get shirty when the compliment is returned? Did someone say the Life Coach is a dying breed? Far from it, there are other hybrids around calling themselves motivational speakers, professional life organisers etc. I'm relieved to find this sensible blog post among all that life coaching marketing hype. A "paid friend" is too phony for my comfort. I have just received my M.Ed in Mental Health Counseling and have my National certification. I have applied for my LPCA. 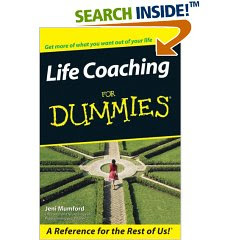 I am incredibly offended by people with no education or training claiming to be "Life Coaches", and in some cases, counselors. I have worked very hard for my degree and have strict ethical guidelines to follow, which are mandated by a state and national board. To me, they are discrediting my profession, and foremost are putting their client's welfare in jeopardy. These are people who could be doing great damage, after all they claim to be guiding others through their LIFE journey. They should be regulated and receive the proper education and training. It seems that this post and many of the comments were written with very little idea about what life coaching actually is. While there is no regulating body (yet), there are plenty of intensive qualifications out there which definitely make sure that a life coach never tries to do the job of a mental health professional. It is not a threat or an insult to professionals with doctorates or mental health degrees, as the two fields tackle completely different things. It would be very unethical for a life coach to try "fixing" somebody who clearly needed help from a counsellor or psychiatrist. In this fast-paced world, we can hire people to plan our weddings, do our shopping, take our kids to school, massage our backs, cook our meals, advise us on our finances. Are there people all ripping us off too? Surely friends and family used to do these things for us, too? Personally, I think that while it might be sad to see people so busy or emotionally caged that they can't open up to people they know or listen properly to their friends, it is good that the option exists. Do you even know what a life coach does? They don't advise you or tell you what to do. Yes, there are some who appear smug and charge extortionate fees, but don't let them represent the entire field. My friend does a lot of free coaching to gain experience and only intends to charge enough to make a modest living (£30 an hour or so) - she has helped me a lot just by asking questions that most people are too self-absorbed to really ask. Unless you're lucky enough to have friends and family members who are not biased as to what you should do, a life coach can be a great go-to person when you need help making decisions or managing stress. I just don't see why you feel the need to attack the field so publicly. Nobody is forcing you to get a life coach. We are ripped off every day by the fashion industry, banks, oil companies and the food industry and yet those who speak out against them are attacked as hippies or "loony liberals". Why attack people who actually want to make a positive difference? Listen, I did find this post reasonable and certainly don't brand people as 'liberal loonies'. I count myself as a liberal. OK life coaches never cross into the sort of 'counselling' that medical professionals provide. This I know something about, and even there I have reservations about NHS provision. Neither do I have a problem with people finding others they can 'open up' to. My view, is that the 'professionalisation' of something so vague and intangible by branding it 'life coaching' is wrong. The problem is real enough, the solution has led to HR departments seeing themselves as responsible for the mental health of senior executives. It's a self-defined profession with no professional body of evidence, nor credible qualifications ans ill-defined skills. I haveworked in training and HR for 30 years and seen no end of fads and fashions, where well-meaning people make good money by looking at the world through pathological lens. That's why I chose to blog on this issue. Note that I've blogged against this in many other posts Freud, Rogers, NLP etc. Blogs are an expression of personal belief. These are my beliefs. I fully agree with Donald. I too am a qualified clinical professional with years and years of practice and supervision. I am amazed that these amateurs pretend to be professional counselors, inflicting their home-spun advice for cash. What next? A Life Coach isn't, and shouldn't, be someone aspiring to know all about life, as who can?! It's really just an umbrella term for someone helping people solve a problem in their life. Most people don't need life coaching, however some people do need help in certain areas of their life. For example if someone is lacking in confidence there are methods to develop confidence in someone using proven psychological and scientifically proven methods. e.g. CBT can help (by challenging thoughts etc). Can a friend help someone fix another friends anxiety? Well if you haven't studied psychology then no! You might make them feel better for a while but long term fixes for anxiety require psychological intervention. I would hope that a good life coach had studied psychology and not mumbo jumbo things like NLP or spirit guides! Also some people are good at diagnosing problems and helping another person overcome those problems. A problem often has both practical and emotional issues that need resolving. A mixture of psychological techniques and skilled diagnostics can help resolve such issues. I definitely agree that there are a lot of bad life coaches out there, just as there are lots of bad psychiatrists and doctors. If you really want to criticise a profession then start asking why almost everyone who visits a psychiatrist never gets fixed. Could it be that it's mumbo jumbo? I think so. Anti-depressants have been scientifically to be merely placebo, just with worse side-effects! Life coaching is another seductive business marketing fad by the same "Harvard bussiness school types" who peddle the MBA. The results will be similar, US industry and others who follow US management ideas and practice; banks bankrupt, GM bankrupt, Kodak, Chrysler, Polaroid, etc. The changes executives need to make are cultural. To do that they need the necessary skills. Those can be developed by proper training programs, not by sittino for two years in MBA classes, no matter how many cases you study, or by sitting with a coach once a week. Unless coaching is just another way to deliver therapy. In this case it can help the individual but the impact on the overall business will be negligible because tle ebroblem of business is not that some executives need therapy but that those who are OK, the majority, just have wrong or limited ideas about how to manage people. This is why the US, UK, France, Spain, etc., are less competitive every day, why those countries are poorly managed and why their industry is sinking. Wow, what a negative, judgmental view of people searching for some support. Coaches act like mentors, especially when they have accomplished what you are looking to do so yourself. I found a phenomenal online coach, which has both private and group coaching. They have helped countless people accomplish goals on every level. Sometimes they just help us 'get out of our own way'. I did, and doubled my income within a year. (The site is www.ftrnation.com).Interesting point of view. I think I'll agree to disagree! !